Our company is named among the renowned Suppliers of Rhinagra Capsules. They are expectorant, anti-inflammatory, analgesic and promote elimination of mucus from the lungs. These capsules are effective in relieving sneezing, running nose, chest congestion, itching and watery eyes. 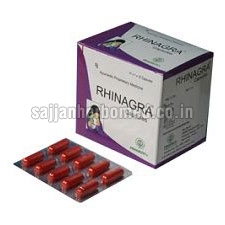 Also, Rhinagra Capsules strengthen the overall immunity system of the body. We are capable of delivering retail as well as bulk orders of Rhinagra Capsules within the promised time frame. Causes : Allergic Rhinitis is caused by certain substances like dust, pollens, animal hair, sudden change in climatic conditions, various chemical products like cosmetics, perfumes and drugs. Consequences : Persons suffering from Allergic Rhinitis and Allergic Bronchitis experience continuous sneezing, mucus flow from nose, breathlessness, recurring headaches, swelling of eyes and face. Doâï¿½ï¿½s : Fresh vegetables and fruits like oranges, apples. Donâï¿½ï¿½ts : Avoid consuming ice-creams, cold drinks, sweets, tomatoes, peanuts, stale food and sea-foods such as fish, prawn, crab, shrimp and squid. Dosage : 1 cap thrice a day or directed by physician.